The beauty of Andalucia and its sea coast is obvious, however, apart from storytelling cities and villages and sunny beaches, the region also has to offer some hidden but very well known for everyone nature spots. One of the which is called Caminito Del Rey will take over this article. El Caminito del Rey which in English could be translated as The King’s Little Pathway is a pathway which 7.7 kilometers and which is constructed next to Gorge of the Gaitanes (Desfiladero de los Gaitanes). The Caminito del Rey goes along the Canyon above the river called Guadalhorce in the province of Malaga, Andalusia, South region of Spain. The Caminito Del Rey was constructed in 1905 however just after King of Spain Alfonso XIII visited and crossed the walkway in 1921 it got the present name and became a popular attraction. The path was closed in 2000 due to the disrepair and horrible accidents during which several people lost their lives. The most famous death is of 3 men: Antonio, Andres, and Martin who lost their lives in 11th of August of 2000 trying to cross the path with a zip wire. A black plaque which can be seen by walking through path now serves as a memory of those who lost their lives and tells the visitors that The Caminito Del Rey was not always so innocent as it right now. The Caminito Del Rey was reconstructed and reopened in 2015 and since then it is available for a public. The Caminito Del Rey is well-known walkway worldwide. Some of the scenes of the film Von Ryan’s Express of 1965 were shot at the pathway. During the late 20s, the pathway got a name of the fear factor, the world’s scariest hike, most dangerous footpath and other similar names. The articles about the path were written in the guardian, telegraph, dailymail and much more. After the path was reconstructed the same and many more newspapers now promotes the path as the safe and one of most beautiful attractions of Spain. In 2015 Lonely Planet nominated the walk as one of the top things to do while in Spain. You must book in advance. The Caminito Del Rey is a very popular path all year round and must be booked in advance. During the summer season, we would suggest doing it at least few months before planning visiting it. You can make your booking directly on the official website. The regular not guided single entrance will cost you 10 euros and guided one 18 euros. The path is linear and not circular. It has two entrances South and North. The indications from which entrance you will start is given in the ticket. At the moment the path start/ entrance is in the north of the path and exist is in the south. The path from the entrance to the exit is only 2.9 Kilometers long. However, there are extra 4.8 Kilometers which you will have to walk until getting to the entrance and after exiting the path. So in total, you must be prepared for 7.7 Kilometers walk. It will take you between 3 and 4 hours to finish the path. Since the path is linear you will need to take a bus. If you are coming by car and park close to the north part of the Caminito Del Rey after finishing the path you will need to take a bus which will bring you back to the north part and hence to your car. If you do all the way around and decide to park in the south part of the Caminito Del Rey, then you will have to grab a bus from the train station of Alora towards the north/ entrance of the Caminito del Rey. If you are coming by train, then you will have to do the same as those who leave their cars at the south part of the Caminito del Rey. The single bus ticket will cost you 1.55 euros no matter which direction you take. Although the path is very safe and accessible for nearly everyone at the moment it is forbidden to enter the Caminito Del Rey with kids who are under 8 years old. Also, those who are entering must wear appropriate footwear and clothing. In addition to this big bags backpacks, selfie sticks, tripods, umbrellas and other items which can put the person or other visitors in danger are forbidden. At the entrance, everyone will be provided with the helmets which must be used until the end of the path. Full security instructions are given here. 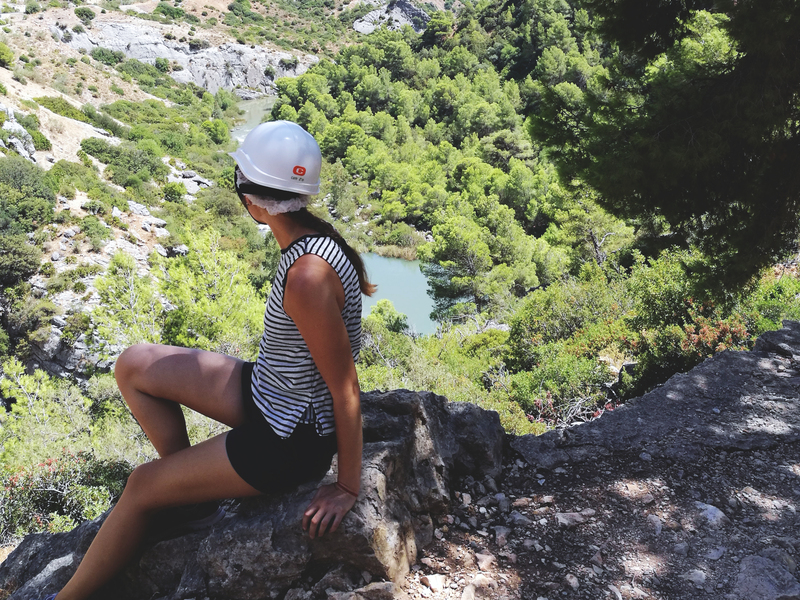 Are you ready to conquer the Caminito del Rey which was also called the most dangerous path in the past? Don’t worry it is safe, super fun and definitely impressive!